The prominence of Software Testing and the impact of keeping the ‘Testing Phase’ at the end of the Software Development Lifecycle. This realization happened since the cost of the bug identified towards at the end was very high and tremendous effort & more time and resources was required to fix them. Testing is not just only about doing regression testing. To overcome this, Shift Left Testing process is introduced. Shift Left testing is an approach to software testing and system testing in which testing is performed earlier in the life cycle. 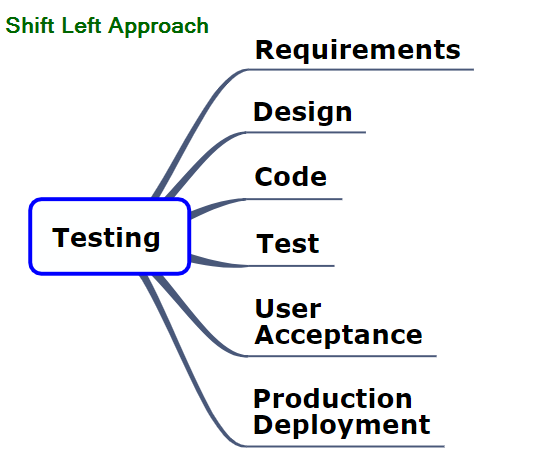 Shift Left approach is nothing but involving the testers much earlier in the software development lifecycle. This would allow them to understand all phases of the project. Apart from this, testers can consider its functionality, ask the right questions to the right people (customers, business analysts, and developers,) seek clarifications. Also, provide feedback wherever possible to support the team. This involvement and understanding will lead the testers to gain complete knowledge about the product or project. Think through various scenarios, design real-time scenarios based on software behavior. This would help the team in identifying the defects even before coding is done. Teams can keep their focus on quality and work towards the prevention of issues and prepones the testing schedule. This approach allows the developers to take more ownership of their code and in turn increases their code quality. Working together in every phase of development life cycle of the project/product. This approach will reduce the cost and speedy delivery of the project to the market. Shift left testing will work very well in an agile environment. It empowers testers to articulate the overview of the phases as well as made them inherent part. It will highlight that the tester’s skills are not limited to finding bugs. They will be able to showcase their talents in the analysis, a review of other work products. It is a great methodology to follow. Bhavani, Quality Architect at DCKAP hold Certified Software Test Manager and Six Sigma Green Belt. Have a passion for testing and learning, as well as implementing and mentoring the latest automation tools. Testing Guild 2018 conference speaker and a frequent blogger. Manage a fast-growing, dynamic QA Team. And leads the group bringing you https://www.qatouch.com.